Alcohol proof is a measure of how much ethanol (alcohol) is contained in any alcoholic beverage. The term "proofing" originated way back in the 16th century when payments to British sailors included rations of rum. To ensure that the rum had not been watered down, it was "proved or proofed" by dousing gunpowder with it and then testing to see if the gunpowder would ignite. If it did not, then the rum contained too much water and was considered to be "proved under proof". Gunpowder would not burn in rum that contained less than 57.15% ABV (alcohol by volume). Therefore, rum that contained this percentage of alcohol was defined to have "100° (one hundred degrees) proof". The gunpowder test was officially replaced by a specific gravity test in 1816. Then came along the old moonshiners who developed and used the simple shake test. It’s an old school technique to test the proof of moonshine and works well if you have the experience. If your just starting out I’d suggest you try this method and then move on to testing it with a Hydrometer, see just how close you were to predicting the Proof of your Brew. The faster the bubbles disappear the higher the content of alcohol. 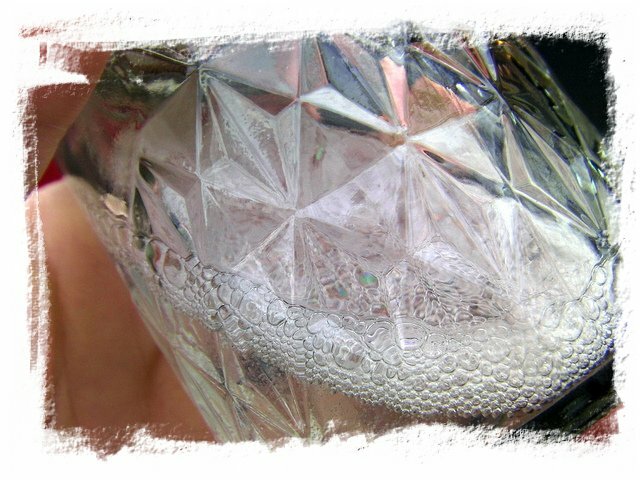 For example a bottle of 80 proof Moonshine when shaken will have small bubbles that will disappear after several seconds. Where as a bottle of 180 proof Moonshine will have large bubbles that will disappear instantly. You will obviously have to practice the Shake test many times before you can accurately predict the Proof of Moonshine. Today the best way to proof any alcoholic beverage is to use a Hygrometer. So What Is a Hydrometer and how do I use the dang thing? A Hydrometer is merely a tool used to determine how much alcohol is in our mash. The majority are simple glass tubes that are sealed at both ends and weighted or ballasted at the bottom for correct buoyancy. There is a graduated scale within the glass tube. It basically measures the density of any liquid in relation to water. There are 2 types of hydrometers that are used in conjunction with moonshine, brewing and distilling. If you are looking to distill spirits you should own both a brewing hydrometer and a spirit hydrometer as they are both calibrated differently. You can't use a brewing hydrometer to measure the final proof of your distilled product and you can't use a spirit hydrometer while making your mash. This article will focus on the proper use of brewing and spirit hydrometers. Brewing hydrometers essentially measure the amount of sugar in mash and wash. The more sugar in your mash, the higher the hydrometer will float in the liquid. Once the mash has finished fermentation it's now called a wash, another hydrometer reading is taken to determine how much sugar the yeast consumed and turned into alcohol. The greater the difference between these two numbers, the higher percentage of alcohol there is in the wash. Pretty simple huh? O.K. 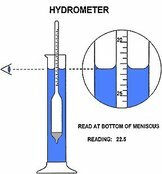 there are 3 scales on most hydrometers. We're going to focus on the specific gravity scale for this article. The Brix scale which is most often used in wine-making. The Potential alcohol scale which is a rough estimate of potential alcohol for your mash.The Specific Gravity scale is used for brewing. To start fill a glass container with your mash and float a hydrometer to determine the original gravity (OG) An original gravity reading is taken to determine how much sugar there is in the mash. This reading is taken before fermentation and just before yeast is added to the mash and it is stirred or aerated. As we mentioned above, the original gravity reading measures the amount of sugar in the mash and roughly indicates the percentage of alcohol that can be expected in the wash, assuming that everything goes as planned during the fermentation process. Naturally OG will vary depending on the recipe being used. For example if a particular moonshine recipe for corn whiskey has a starting alcohol of 1.055 and only produces wash with alcohol cont in the 6% - 7.5% range. To start with write down the OG of your mash, as you will most likely forget what it was by the time it is done fermenting, especially if you have multiple batches fermenting at the same time. Sticky notes pasted on each fermenting mash container is simple and works for some. Keep in mind that this reading alone does not tell you the alcohol content of your wash. It only tells you the potential alcohol content. You must take another reading FG (final gravity) and compare it to OG to determine the actual alcohol percentage of your wash, which we explain in the next section. Fill a test jar almost to the top with liquid (you don't want any solids). Gently drop the beer/wine hydrometer into the test jar and as you do you want to spin the hydrometer as it is placed in the liquid to dislodge any air bubbles that might stick to it. You will see that the hydrometer floats in the liquid. Write down the number you see on the hydrometer. Final gravity measures liquid density, just like the original gravity reading does. However, if there weren't any problems during the fermentation process, the liquid density should now be much lower because the yeast consumed all of the sugar (which increases density) and turned it into alcohol (lowering density). The difference between original and final gravity will tell you alcohol percentage of the wash. These steps assume your mash has been fermenting for at least week and the activity (bubbling) in the airlock has slowed down significantly, if not stopped completely. If the airlock has not slowed down then wait a day or two longer. Significant bubbling in the airlock means that the yeast is still working and that equates to more alcohol. Once again fill a test jar almost to the top with liquid (you don't want any solids).Gently drop the beer/wine hydrometer into the test jar and as you do you want to spin the hydrometer as it is placed in the liquid to dislodge any air bubbles that might stick to it. You will see that the hydrometer floats in the liquid. Write down the number you now see on the hydrometer. We are generally looking for a reading of around 1.010 or below. If the reading is above 1.010 let it sit for a few days and then take another reading because the yeast might not be finished with their job yet. Keep taking samples over the next few days until the reading does not change for 3 days in a row. Hydrometers are calibrated to be used at 60 degrees. Consequently if you are taking a reading of your mash and it is above 60 degrees you'll need to adjust for the actual temperature reading. There are many online calculators for converting readings taken when the liquid if it is above or below 60 degrees. You need both your OG and your FG to determine your ABV (alcohol by volume). The sample we took for this article was at 1.090 and the mash fermented down to 1.010. You can do a simple math equation to figure it out. Subtract the Final Gravity from the Original Gravity. Then multiply by the difference between FG and OG by 131. 1.090 minus 1.010 equals 0.08.0.08 X 131= 10.48The wash is 10.48% alcohol. Some recipes will produce lower starting alcohol and some will produce higher. Starting alcohol as high as 20% can be achieved if a ton of sugar is used in combination with turbo yeast. However, recipes with a starting alcohol in the 5 - 8% range will actually produce a much better tasting final product than recipes with 10% or higher starting alcohol content. To test the finished product from your moonshine still float a Proof and Tralle hydrometer in the spirits. This type hydrometer is used to calculate proof in higher alcoholic beverages such as spirits and liqueurs. The scale goes up to 200 proof and therefore it is not accurate for lower alcohol products like beer or wine. BTW As a reference point I wholeheartedly recommend the book Moonshine written by Matthew B. Rowley that can be found in our book department. The book Moonshine is chock full of information. A history of moonshine, plus recipes, how-to's, and much, much more. It's a fantastic and fun to read book, with an in-depth look at the history of moonshining from the beginning all the way to present day. This book also outlines the basic process from fermentation through to pot distillation, along with how-to's. A number of traditional recipes for Whiskey, Rum, Schnapps, and more.